To be honest, it wasn’t until my dad found a copy of THE PRINCESS BRIDE in the Trade-In section of our library that I even knew that it was anything more than a movie (albeit one of the greatest movies of all time). I loved the movie and I know from experience that the books are usually ten times better, so I really looked forward to reading this novel. My family was going on vacation, so I tucked it away for the car ride (not an easy task) and began to thumb through it as soon as the sun was up (we always leave super early). I was easily forty pages in before I realized anything was amiss. Wasn’t The Princess Bride supposed to start with Buttercup ordering the love of her life around? Well actually, no. If you remember correctly, you’ll find that The Princess Bride actually begins with a sick boy in bed trying to get out of his grandfather’s cheek pinching. The Princess Bride begins with the narrator, William Goldman himself, floating in a pool and eventually reminiscing on a story his father read to him when he was feeling down himself. Next follows the story of how Mr. Goldman intends to track down the one and only copy of S. Morgenstern’s epic tale in order to present it to his son as a birthday present. The narrator then quickly realizes that the story his father had read to him was a rather condensed version of the actual epic- his father had taken out all of the flowery bits to make it more appealing to his young audience. Realizing his son couldn’t possibly enjoy the dusty tome he’s been presented, Goldman sets out to abridge and keep “just the good parts”, and that is what his readers are then presented with. I found this book absolutely charming. I love it very deeply. Usually, when there is a movie adaption of a book I find myself with two options: A) Treat the movie and book as entirely separate entities (Ella Enchanted) and love them both or B) Only love one version- usually the book(Percy Jackson and the Lightning Thieves). 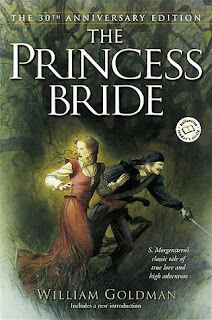 The Princess Bride brought me to conclusion C) Allow the book to enhance the movie. I was so surprised to find that there were answers to questions I didn’t know I had (Why on earth would Miracle Max have a holocaust cloak lying around?). I cannot recommend this book enough. I just can’t. Stop looking at your screen and get this book already dagnabbit! I have a further recommendation to make: get the deluxe edition of the movie and watch it while listening to William Goldman's commentary track. In it he gives insight's on both the movie and on the book itself. I consider it well worth the time. I love this book! I read it before I saw the movie, so I was able to fall in love with the story, then see it translated perfectly onscreen. I have no patience for the many who insist that the book "isn't as good" as the movie; it's just different! Julie, how cool that you read the book before you saw the movie!! I don't think I even knew there was a book until after the movie became one of my all-time favorites! And Steve, I have that version of the movie and didn't realize Goldman has a commetary on there! Thanks!! I've always loved the movie, and I'm reading the book right now, for the first time!! !